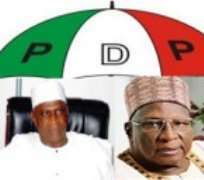 We have learnt with sadness the continued effort by Tukur and his NWC to rubbish the democratic credentials of PDP by embarking ceaselessly on exercises of impunity by announcing the suspension of Alh. Abubakar Kawu Baraje who was once the National Chairman of PDP, Dr. Sam. Jaja, one time National Vice Chairman of PDP, Barr Olasgunsoye the current National Secretary of PDP and Ambassador Ibrahim Kazaure who was once a member of the PDP NEC in flagrant and abuse of the PDP Constitution Article 57 subsections 7 and 8 which states that "Notwithstanding any other provision of this Constitution relating to discipline, no Executive Committee at any level except NEC shall entertain any question of discipline as may relate or concern a member of the NEC, Public Officer Holder I.e. Ministers, Ambassadors, Special advisers or any member of the Legislative Houses! No disciplinary Committee at any level except National Disciplinary Committee shall impose any punishment provided under Article 57 of the Constitution arising from any disciplinary on any person named in Article 57 of this Constitution. With this sections of our Constitution and considering that Prince Barr Oyinlola by his position as the incumbent National Secretary of PDP as stated by the Appeal Court and considering the privileged positions both Kawu Baraje, Sam Jaja and Ambassador Kazaure have occupied in the party it becomes a imperative and a sacrosanct fact that only the NEC of the party and not any funny NWC can suspend such calibre of members of the party as mentioned above therein and sadly for the ignoramus handling the affairs of PDP at the moment which undemocratic acts are legendary the continued plot to expose our party as lacking in principle should be condemned by all and sundry. This illegal act exposes Tukur and his NWC as lacking not only democratic character but lack common understanding of the PDP Constitution. To us this is an abuse of the Judiciary which recently reinstated Oyinlola as the National Secretary of the party, abuse of the Nigerian Constitution on fair hearing and most importantly exposing the intolerant attitude of Tukur and his sponsors..
With this greatest joke of the century, Tukur and his funny NWC have only succeeded in exposing themselves not only as champion of undemocratic acts but the greatest enemies of PDP as all their actions are all geared at ensuring that peace eludes the party. Nigerians can now understand why we are hell bent of ensuring that these military mentally inclined men are removed from our political psyche if we are to enrich and uplift our democratic credentials. Finally, this uncivilised act and action is not acceptable to us as we insist that Prince Barr Oyinlola must be reinstated as a matter of urgency as ordered by the Appeal Court as the National Secretary of PDP. In this regard, we urge INEC and any other government agency not to entertain any document or letter from PDP without the authorisation of Prince Oyinlola in view of the fact that he is the incumbent National Secretary of PDP fully recognised and sanctioned by a creditable Court of our country. We urge all good members of PDP to remain calm, steadfast and focused as we fight the illegality which Tukur and his people represent as the task to strengthen and rebuild our party is a task that we must conclude.